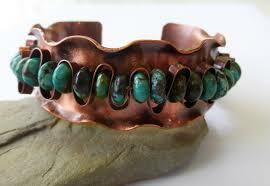 Enter Cool Copper Cuffs. 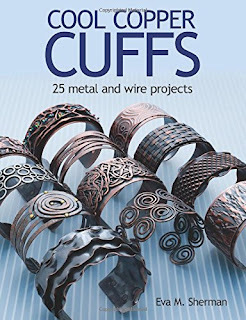 Eva shows you how to make 25 different metal and wire projects, using techniques that you easily adapt to your own personal preferences and style, and that you can apply to other items besides bracelets if that's where your fancy takes you. This is not a beginner's book, but Eva's instructions and the wonderful images that Kalmbach is known for, are so good that if you are a really really determined beginner, you could work your way through the book and improve as you go. There are four sections to the book, starting with materials, tools, and techniques. Unless you are already a master with metal, you will not want to skip the techniques section. I don't personally work with a lot of metal, at least not with hot connections and brazing, and I found Eva's instructions to be very thorough. 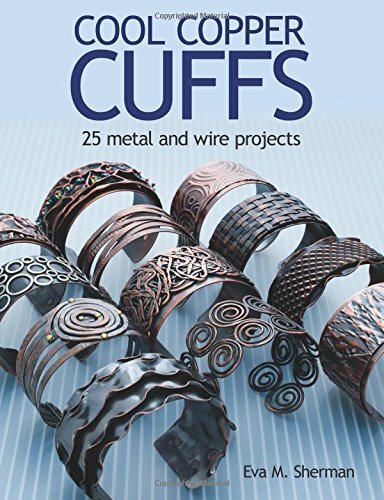 From there, Eva guides you through the projects, with one chapter for wire cuffs, one for metal cuffs, and one that combines them both. It makes me very sad that I will not be making most of these...so much to make and so little time...but right now it's just outside my wheelhouse. SO, if any of you feel sorry for me and want to make me one, we can talk! That's my favorite, up above. Thank you for a lovely review!! !